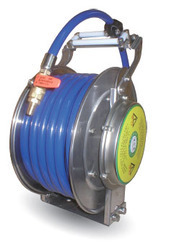 Our range of products include fire fighting hose reel, lp gas hose reel, petroleum hose reel, pressure washing hose reel, spring rewind hose reel and cabinet double hose reel. 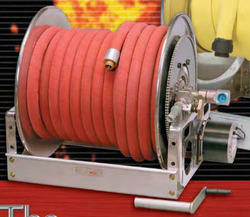 Exclusive Air Hose Reel with good and compact design. Optimized Model of small capacity and short length hose. Install by oneself with lightweight. Install in one cabinet with Air Hose Reel & Cord Reel. 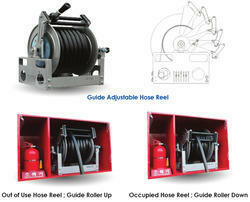 Use conveniently one cabinet inside Air Hose Reel & Cord Reel. Excellent durability with long life spring. Stable take out of hose and cord by use 4way guide roller. Install Position: Wall, Ceiling( within 4MR). Use: Car Repair Center, Assembly Line, Industrial fields. Exhale them into the atmosphere through the plumbing connected after inhaling exhaust gas with high temperature. Excellent rewind apply strong electric motor. 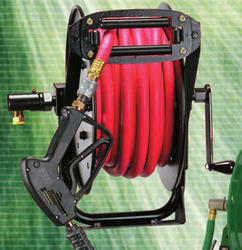 Protect damage of hose by limit system. Option : multipurpose muffler nozzle. Use: Vehicle workshop, gas station, training center, laboratory. · Dual frame, guide plate & ball bearing support and 4-way roller assembly..
· Maximize material flow with minimal pressure drop for faster fills. 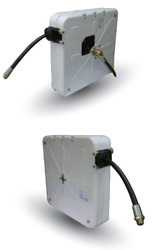 · Compact pedestal and spool fits into tight spaces and can accommodate 10MR~30MR hose capacity. · Painting: powder coated for long life. 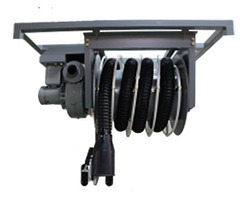 Reels are all stainless steel construction with strong corrosion resistant. Compact design with all bolted assembly without welding. Dual frame, guide plate & ball bearing support. 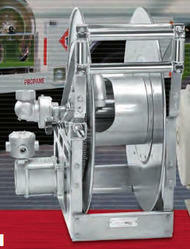 Exclusive water reel for Food Company, facility of communal feeding. Special heat-treatment spring & non-corrosive ratchet. Wide usage with 120 degree swing. All(Outlet & Inlet) connection threads are female NPT. Specifications: Manufacture with portable cart type for moving bulk rewound hose . It’s easily moving by cart with heavy weight. It’s stably moving at off-road by installed 10 inch caster. Special heat-treatment spring & ratchet. Full flow shaft and swivel. Spring Rewind Reel for Oil, Air, Water, Grase etc. 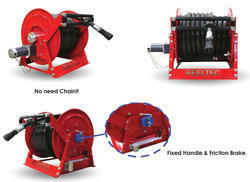 EN Series are fully enclosed & spring driven hose reel. Lightweight steel construction and attractive design. Lightweight steel construction, compact design. Full flow shaft and 3/8" swivel brass Joint. 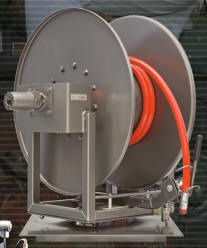 Manual Rewind Reel Fuel Dispensing, Chemical Transfer, etc. 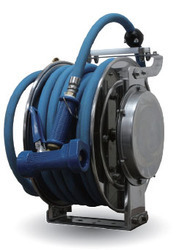 Heavy duty steel construction reels designed for long lengths & large hose reel. Dual frame ,guide plate & ball bearing support. Special heat-treatment spring & non-corrosive, non-sparking ratchet. Heavy duty steel construction and without frame. Working hydraulic pressure with electric power and signal cable simultaneity. Apply power spring for smooth working at high pressure. The cable have penetrated into hose for save cable. Guide Roller can move up and down according to draw out hose direction. Efficient space application by compact design. Excellent Rewind capacity by strong DC Motor. Make better use of space. Apply Manual handle of Bevel Gear Type. Using quickly and at once go draw out hose 100MR from reel without other connect hose. Rewind hose by strong DC Motor after using. Drain reaming water in hose during rewind hose. For power transfer using spur gear instead of chain gear. Efficient space application by use spur gear. No danger for safe accident with no using chain. Excellent Strong DC Power Motor. Use conveniently by roller guide of left and right turn with hose direction. Apply explosion proof motor of prevent explosion as using high pressure LPG Gas. Apply 1.5 inch swivel Joint & 1 inch Shaft for supply hydraulic fluid smoothly. Apply swivel Joint for excellent air tightness. Apply #40 chain for transfer strong power & Manual handle of Bevel Gear Type. Auto aligner of Hose : Prevent for twister, stumble or lean of Hose. Chain Cover : Installed safety cover of chain gear for prevent safe accident. Usage: OB Van. Generator Truck, Firefighting Truck & Special Vehicles. All bolted assembly without welding. 4-way guide roller assembly. Roller position must be specified. Quick connection to your welder. For use with single conductor electrode cable or grounding lead. Declutching arbor is provided to prevent damage from reverse winding. Can be control Argon and Tig welding cable by one reel. Increase usability and easy control workings. Facilitate by custom made according to working place or usage. 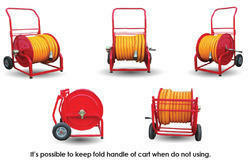 Crane hose reels are furnished standard with synflex hose. 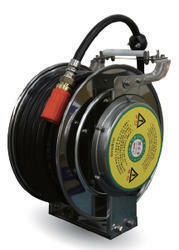 Looking for Hose-air, Gas, Fuel, Liquid And Line Reels ?